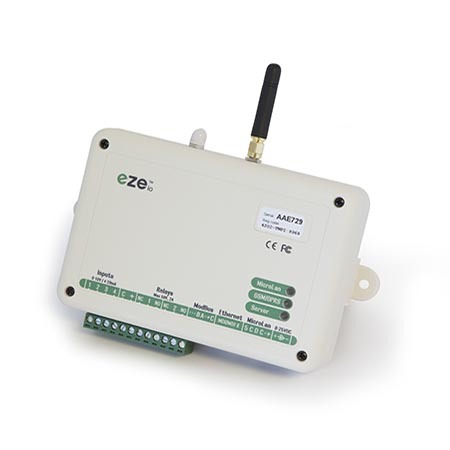 Ezeio Controller – Cellular – AYA Instruments, Inc.
With both the local 868/900MHz radio and the GSM/3G/GPS modem added to all the standard features of the Eezeio Controller, this is our top end product. All models of the Ezeio Controller share the same simple setup process and flexible configuration. The cellular radio is used for network connectivity in situations where a physical Ethernet connection is not available, or a backup is required. The Ezeio will automatically switch over to cellular communication if it is unsuccessful contacting the cloud servers via Ethernet. The 868/900MHz radio is used for local communication (up to 100m/300ft range) with sensors and input/output expansion modules. This radio is using a proprietary, encrypted protocol designed specifically for the Ezeio system. The Ezeio comes complete with GSM antenna, power supply, an Ethernet cable and 4 months of basic service. Additional service is easily purchased via the web interface. Access to the web UI for configuration and live data is included for life. Includes GSM antenna, 12VDC power adapter and a 6ft Ethernet cable.